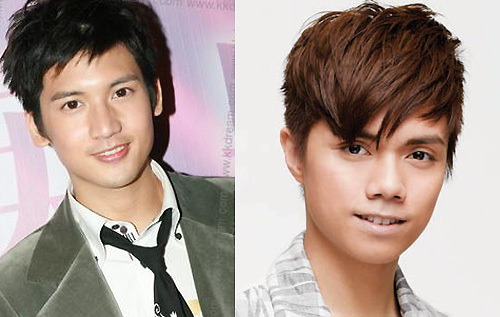 Boyz member, Kenny Kwan (關智斌) and Hins Cheung’s (張敬軒) “intimate relationship” rumors have circulated for five years. The pair were often photographed dining out together and frequented each other’s homes. Despite allegations that Kenny and Hins were living together, the men continued to deny such rumors. Last night at 7 PM, Kenny was spotted wearing glasses and carrying a backpack. Leaving behind good friend, Hins Cheung, Kenny walked alone on a street in the Causeway Bay district. Wandering aimlessly for some time, Kenny walked near a bar on Hoi Ping Road to meet with a long-haired man. The pair finally entered a nearby building before disappearing from the reporter’s line of vision. Jayne: Any additional details on Kenny Kwan and Hins Cheung’s relationship? Didn’t realize the rumors have been circulating for 5 years already; the headlines must have been very mild…. I never knew that Kenny is rumored to be gay until last year or so. I am surprised that their rumor have circulated for five years. I never knew that Kenny is rumored to be gay until last year or so. I am surprised that their rumor have circulated for five years. So I am really confused, didn’t Hins dated or rumor to be together with Ivana Wong and she admitted to the relationship. So were they doing this as publicity? Hins have been rumours with both Ivana and Kenny. I believe he’s great friends with both. This gay rumours have been going on for years. What I like about this friendship is they were never bothered with the rumours and continue to be close friends, doing stuff together. Do you think Kenny and Hins are just good friends or more? Did they ever speak about each other in a way that implied more? I didn’t analysis their words. I always take celebs’ word for it until proven otherwise in this matter. Since they never admit to it, I’ll take their relationship as purely friendship. But, if it turns out that they really are a gay couple, I’ll still continue to support them. Hins and Ivana had rumours before Hins and Kenny. After the reporters have new target Kenny, Ivana is never mentioned. But Ivana likes to mention hins a lot. I remember her telling the reporters about how they bickered on the phone and he had to call her long distance to apologize. They’re like mutually needy towards each other. Kenny and Hins rumours are like Joey Yung and Denise Ho. Very long standing rumours. I’ve read about it for some years already. I remember a reading a tabloit showing Hins and Kenny wearing matching shoes and they supposedly hold hands (but the picture looks more like angle issue than really holding hands) Both men never admitted to the relationship. But they never hide their friendship due to the rumours either. I like this of them. They openlya admitted to going to each others’ home. Hins sometimes have dinner with Kenny’s parents because Hins’ family is in China (Hins can from Guangzhou). Hins also said when he first came to HK, Kenny helped him a lot. Hins, on the other hand, help put in producing Kenny’s album and wrote a song for him. I think they also take care of a dog together (I don’t remember whose’s not is it or who is helping who take care). Not very long ago, there’s a news that Hins admitted to their relationship because Hins said Kenny is like a ‘little wife’. But, actually, Hins was just describing and aspect of Kenny’s personality. Whether they are gay or not doesn’t matter. I still like them both, especially Hins. Love his voice. Thanks for the background on Kenny and Hins’ rumors and friendship. I didn’t realize that these rumors were circulating for such a long time. Whether friendship or more, glad that Kenny and Hin continue to enjoy their company and did not decide to avoid each other as a result. Uhm, Kenny’s singing career is kinda half died, so actually EEG dun care much about him as well as ban him to be friend of Hins. I am sure they won’t be bothered whether you like them or not. I rmb there is a tabloid showed pix of them “kissed” during EDC’s scandal time so it faded. Watever, I still like the idea they are a couple. Good friends or gays, no matter what. Same. I watched an episode of Beautiful Cooking where he was being teased the whole time. He was a guest when Ivana was a contestant and he seemed to handle all the marriage rumours well during the episode. I had no idea he had rumours of being gay. I believe kenny and hins are a gay couple. OTOH, Hins and ivana’s relationship is kinda ambiguous. They act like they’re a couple but it might just be ivana’s offbeat personality. She’s quite humorous w/ her sweet lil’ voice. I never heard about how kenny and her interact w/ each other though. I wonder if there’s any jealousy btwn them. Hins thanked Kenny under his concert in Macau this Summer. Ivana was the guest singer at the concert. Kenny and Hins are gay and are together. I no this cause I have a friend who works in marketing and works closely with HK artists. So is this rumor that they had break up true?They are such a cute couple and it’s really bad that they had to hide their relationships just because they are artist.